“The benefits of breastfeeding for mother, child and society are many. Offering a quiet, comfortable place to nurse or use a breast pump helps women meet their breastfeeding goals. We are so excited that the Milwaukee County Zoo welcomes breastfeeding anywhere a mother feels comfortable, and is an early adopter of this amenity for mamas and babies on the go,” says Sascha Mayer, Co-founder of Mamava. Mamava is dedicated to transforming the culture of breastfeeding, making it more optimistic, realistic, accommodating and inviting to all mothers. Breastfeeding is a personal choice, and there are as many philosophies and styles of breastfeeding as there are breastfeeding women, and women who choose to breastfeed should be able to do so whenever, wherever they and their babies feel most comfortable. Mamava believes it’s a good thing for mothers to be on the go, but that they shouldn’t have to use a breast pump or breastfeed in a bathroom, storage area, dressing room, or any other undesirable location. All mothers deserve a safe, clean and comfortable place to use a breast pump or breastfeed – anywhere, anytime. 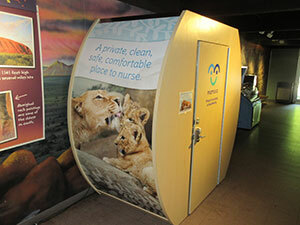 For more information on the Mamava Lactation Suites at the Milwaukee County Zoo, please call the Public Affairs and Services Division at 414.256.5411.